Reebok Spartan Race is not only All-World because of events in 20 countries but it definitely represents the good ol’ USA, especially our Armed Forces which is why they have given the Sports Techie community blog readers a limited code that will give up to $40 off any race. One lucky reader and follower here in the U.S. will win a free 2015 Spartan Race code if you win the Rafflecopter contest giveaway prize. I have not participated in one of these challenging obstacle course races but many a Facebook, Twitter and Instagram friend has but it has been my pleasure to contribute blogs about this tough racing series readable via this link, here. Panasonic just partnered with Spartan Race on a multi-year sponsorship which will highlight Panasonic’s Wearable POV Action Camcorder line and other products. The promo code will work one time for any open heat (non-confirmed start time) in any Spartan Race in the continental US. Discount: $20 off Sprint, $30 off Super, $40 off Beast. Valid for Continental US only, excludes Hawaii. Cannot be retroactively applied or combined with any other offers including GovX. Not valid for Elite, Kid’s Race, or Spectator tickets. Expires 5/29/15 11:59 pm ET. At midnight tonight (5/20/15) our free giveaway raffle begins to win the one free Spartan Race code for some inspired racer who enters via the following link: a Rafflecopter giveaway. All I ask is for you to tweet hashtag #IamSportsTechie to the @SpartanRace Twitter handle but it is not mandatory to do so to enter. Our contest ends on Sunday, May 31, 2015 at 12am EST. Panasonic Named “Official Camera” and “Official POV Action Cam” of US Reebok Spartan Race. Panasonic The sponsorship, which will extend into the 2017 US Reebok Spartan Race season, highlights Panasonic LUMIX as the “Official Camera” and “Official Action Cam” of Reebok Spartan Race featuring the ruggedized A500 POV Wearable 4K Action Camcorder – the flagship product of the Panasonic Adventure line. Panasonic will be the presenting sponsor of the Dunk Wall obstacle at select Reebok Spartan Race events. In addition, the Panasonic A500 Action Cam will be utilized throughout Reebok Spartan Race courses (obstacles, start/finish lines) and integrated into a Panasonic 360o Victory Video Booth near finish lines where participants can create unique 360o post-race videos of themselves and teammates. Course photographers will also be outfitted with Panasonic’s critically-acclaimed LUMIX GH4 professional mirrorless digital camera. A component of the Spartan Race and Panasonic partnership is integration with NBC Sports Group’s coverage of six Reebok Spartan Race events in 2015 including ad spots on NBC, NBCSN, and NBC Sports’ Regional Networks. Panasonic A500s will be used for the creation of unique POV content for race coverage including Panasonic’s sponsorship of a Course Preview segment which will be promoted across multiple platforms. 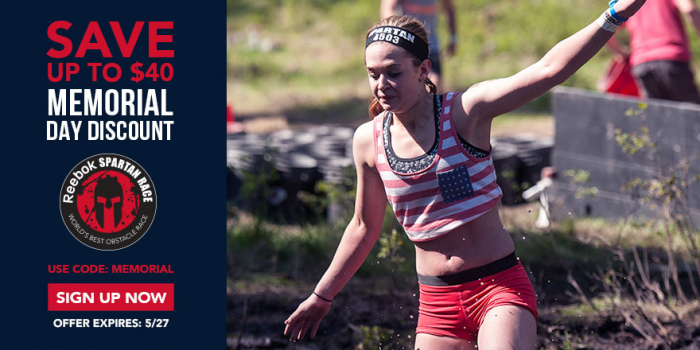 NBC Sports Group’s coverage of the 2015 Reebok Spartan Race Series will begin Tuesday, July 21 at 11 p.m. ET on NBCSN with the Montana Sprint from Bigfork, Montana. Sports Techie, war in not the answer as Bono of U2 sings but freedom is not global yet so the U.S. Army, Navy, Air Force, Marines and Coast Guard work together to not only keep our borders safe but do their best at making sure people all over the planet are not subject to lack of hope by evil. One group of humans that has clearly suffered around the globe over generations is women and Reebok has all of you in mind with an inspirational video that is a little shout out to those who run the world. Enter your region of choice via the following links: North ,South, Central, West. Friends that enter the Atlanta Super, Seattle Super or Pac West Sprint race, or any Sports Techie community member that competes in any other race, be sure to get yourself a Panasonic “Official POV Action Cam” because it includes integration with NBC Sports coverage of six major Reebok Spartan Race Series events. If you are like me, a free giveaway is like eating your favorite food or using an action cam, they are all fun things to do so be sure to give yourself a chance to win the race code by entering a Rafflecopter giveaway. Either way, please remember the spirit of American and foreign veterans and also those that continue to serve the military by challenging yourself to enter and finish a Spartan Race in the region near you.